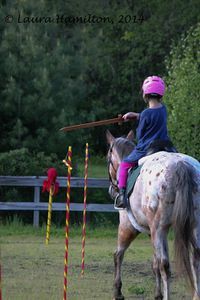 This article explains one method used to make the targets for the equestrian game called "Reeds" or "Reed Chop". 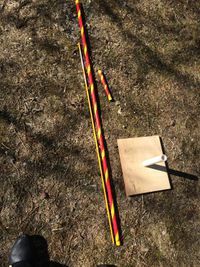 Reeds constructed using this method meet the requirements for the Inter-Kingdom Equestrian Competition rules as of March 2015. I've been making them in 3/4" and 1" diameters. I like to match the diameter of the reed to the diameter of the post. For 3/4" reeds: I use 1/2" (internal) diameter PVC, 3/4" diameter wooden dowel, 3/4" diameter coin-shaped magnets, JB Weld. For 1" reeds: I use 3/4" (internal) diameter PVC, 1" diameter wooden dowel, 1" diameter coin-shaped magnets, JB Weld. Cut the PVC to 5' lengths. For a "standard IKEqC" set, you'll want 10 poles. So make 12. Cut the dowels to 10", 8", 6", 4", 2" lengths. I've just been tying a string to both ends. 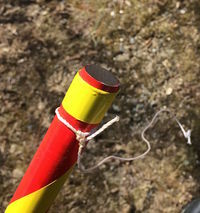 Other people have drilled a hole in each pole and tied a semi-permanent lanyard to each and slipped the reed in and out of it at setup time; I think this works fine, it's just my drill was out of order last time I was making poles. I have noticed that the reeds tend to lose their JB-and-magnet after about a year, and I keep having to re-glue them. I've been considering experimenting with magnets that have countersunk holes in them, and actually using a screw to attach the magnet to the reed, but I had a set like that a long time ago and I noticed that they tended to unscrew themselves on impact and I kept having to screw them back in. This was before I discovered JB, though, so maybe seating the screw with JB would help. Painting tip: get a metal cookie sheet, put down a few layers of newspaper or some plastic, stick the reeds to the covered cookie sheet, and spraypaint your base coat. Works wonders! That's also a super helpful thing when you're spraying on a nice waterproofing clear coat at the end after you've decorated them with your arms and stuff. The pound-in fiberglass driveway markers are the best solution ever and I've used a lot of solutions. I've used the pound-in metal stakes in the concrete reinforcement section, but they're heavy, they're dull pointed so they're a pisser to get into the ground, and meanwhile the fiberglass stakes are nice and light and go right in... no real use using anything else. Theoretically you could use anything with a smaller diameter than the PVC but I favor the fiberglass. 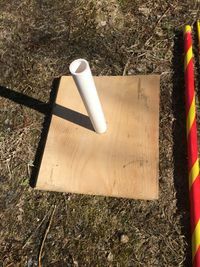 Baron Duncan Kerr created simple bases for the reeds for situations where you can't pound anything into the ground enough to stand up. 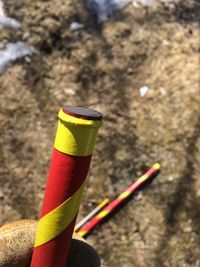 It's a simple 12" by 12" scrap of 3/4" shiplap, with a hole drilled into it and short length of PVC with an inside diameter just larger than your reeds poles jammed into it. See the fourth picture above.